Remember: I back your purchase 100% for one full year (see * below). Peter Valley is arguably the smartest guy in the used-books-on-Amazon biz. 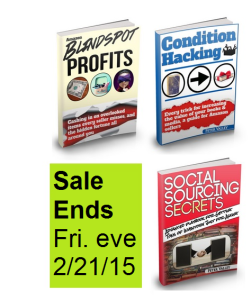 For 2015, he's revealing more of his sourcing secrets in a 3-ebook bundle here. If you think Amazon is over-saturated with inventory, I can assure you the opposite is true. Why? 2.) they don't have basic communication/speaking skills. So when you (the smart reader) spend the tiniest bit of effort into 1.) looking where the greedy, obnoxious sellers refuse to look and b.) saying a few words to those in charge at the various places you source, you can cash in very well. I've read all 3 books - they're 100% no-fluff, easy book sourcing techniques that gross some sellers millions, like this guy (video below). 1.) Watch this video where Peter interviews a $1.5M Amazon bookseller. 2.) Here's a printed interview with another successful book seller. * Peter Valley offers a 60-day, no questions asked guarantee for his e-book. But when you buy his e-book via my link (it’s the same price, instant download),I will personally add another 305 days to that guarantee. So: if you decide the book is not for you (and the 60 days have passed), forward your email receipt to me and I will refund you (100%) out of my own pocket. It’s the same ‘extra’ guarantee I give to several of the excellent guides and services that I endorse. I will make a small commission from Peter when you buy via my link. Previous post: I just bought a wholesale sourcing course. Join me?